Two blocks from the spot where Rosa Parks refused to give up her bus seat to a white passenger in 1955, 17-year-old Tanesha Wilson listens to earbuds as she waits for the No. 8. She takes two buses every afternoon to get to her job at McDonald's after spending her mornings studying math and science, the last two tests she must pass to get her GED and start studying for an accounting degree. "I don't have a car," she said outside the transfer station waiting room, which is full of mostly African-American riders. "I have to take the bus." 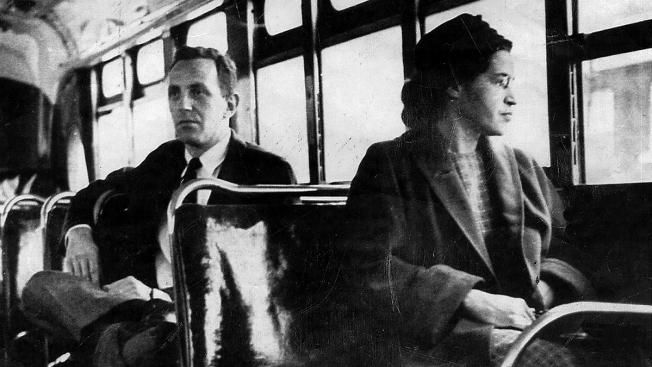 Sixty years after Parks' arrest sparked the historic boycott to end racial segregation on Montgomery's buses, the overwhelmingly black ridership of Montgomery's bus system no longer faces legalized racial segregation — but they face a bus system that advocates call inadequate. "We went from the back of the bus to where's the bus?" said Stephen Stetson, a policy analyst for Alabama Arise, an advocacy group for the state's low-income families. Montgomery's system, like public transportation in many cities, is short of money and long on challenges such as urban sprawl, declining passenger numbers, tight budgets and government policy choices that value freeways over mass transit. Fifteen bus routes crisscross the city, where tourist attractions herald Montgomery's dual role as the birthplace of the Confederacy and the civil rights movement. But some riders say buses don't always run on schedule — as buses break down— and don't go where, and when, they need them need to go. Rosie Ann Reeves works in housekeeping at a hotel less than six miles from her home. The trip takes about 15 minutes by car, but Reeves must rely on the city transit system. Reeves gets up at 4:45 each morning to catch a 6:15 bus that gets her to work by about 7:50 a.m., but she doesn't clock in until 9. "If you miss a bus you have to wait an hour and a half or two," said Reeves. The buses stop in the evening, have reduced service on Saturdays and don't run at all on Sundays. Montgomery Mayor Todd Strange said it's difficult for the city to come up with the $3 million it steers to the bus system each year. "It is always a challenge to make sure that you've got adequate lines, you've got adequate equipment, and we actually run close to a million and a-half miles a year," Strange said. "But is that enough? A lot of people tell you it's not. But, at the same time, are you going to put more buses on or are you going to put more police officers or more firefighters on?" Alabama is one of four states, along with Arizona, Hawaii, and Utah, which provide no state tax dollars for public transportation. Art Guzzetti, vice president of the American Public Transportation Association, said ideally, transit funding is a partnership of federal, state and local entities. "To the degree that one of those partners is missing, the other partners have to do double duty," Guzzetti said. While direct statistical comparisons with 1955 are difficult, anecdotal evidence suggests ridership today in Montgomery is more heavily African-American. In his book, "Stride Toward Freedom The Montgomery Story," the Rev. Martin Luther King wrote that he told city officials during the 1955 boycott negotiations that 75 percent of the segregated bus system's riders were African-American. A 2007 ridership survey by First Transit, which now runs the bus system, found that 84 percent of today's riders are African-American. Passengers on the bus are also disproportionately poor. The survey showed that most earned less than $20,000 annually and had no option to take a car. Stetson said the Southern city has some built-in challenges in trying to sustain a transit system. Sprawl to the city's east side, fueled by white and middle class flight, stripped the city of the urban density that lends itself to an efficient transit system. The state's conservative fiscal climate makes it difficult to raise money, he said. Callie Greer, a bus rider and activist with the Montgomery Transportation Coalition, puts it more bluntly. She believes buses aren't a funding priority since they are primarily used by minorities and low-income people. "This is about economic justice. You have to get to work to have a job," Greer said. Bus system manager Kelvin Miller said they are trying to make improvements but are limited by operating funds. He said the system began using hybrid buses to save fuel costs and is debuting a phone app so people can track where the bus is on its route. However, Greer said the bus system in Montgomery today is much better than it was a few years ago when it was largely dismantled. Citing rising costs, city officials in 1998 abolished fixed bus routes for a system where people called ahead to request a ride. Amid the chaotic change, daily ridership plummeted to just a few hundred. After a public outcry, city leaders reversed course and reintroduced fixed routes two years later. Ridership steadily increased each year. But it took a dip again when the bus system raised fares to $2 in 2012 to balance the budget. "There was a time we didn't even have a transit system to speak of here in Montgomery. As it stands right now we have a . I guess you say like dysfunctional families? We have a dysfunctional transit system here," Greer said. The 60th anniversary of the bus boycott will put a spotlight on Montgomery again as weeklong commemoration celebrates the seminal moment of the civil rights movement. City bells will chime on the anniversary of Parks' arrest and a new historic marker will be placed at her arrest site, near the transfer station where the large city blue buses lumber in and out. "You know if they had the bus boycott back then and all the struggles they went through back then, I feel as though it should be one of the best bus systems in the United States," passenger Larry Love said at the transfer station, as he ran to catch a bus.